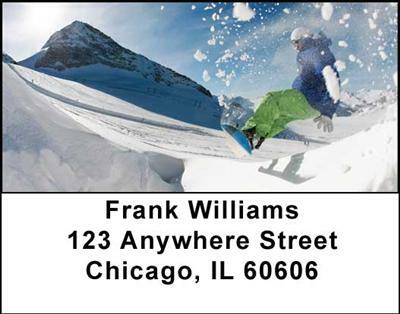 "Snowboarding Address Labels" product is already in your cart. The wonders of winter sports are displayed well in these Snowboarding Address Labels that capture the spirit of fun and adventure that awaits you with this action packed sport. Four magnificent pictures of snowboarders enjoying the snowy landscape of winter showcase their colorful gear against the backdrop of a blue sky and splendor of white snow that is flying through the air with them as they explore the horizons of the fresh white powder. You can make the chore of addressing envelopes more fun with these Snowboarding Address Labels that will brighten your day and those to whom the envelopes are written.